This is a busy week on Nantucket. Not only are we winding down the summer season but sliding into Labor Day weekend with still lots of events going on around town. Tomorrow night I will be talking about my new book from 7 to 8 p.m. upstairs at Mitchell’s Book Corner. 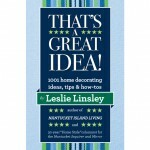 The book, “That’s A Great Idea” is a compilation of the best of my columns in this paper for over thirty years. It’s got lots of Nantucket references to people and places you’ll recognize (some not here any more) and it’s chock full of good ideas, tips and how-to advice for sprucing up your homes with a Nantucket style. The columns represent those that got the most response from all of my readers. And you are all a very vocal bunch. Thankfully I am not writing about politics or any other subject that might be construed as controversial so I bask in more praise than criticism, but I’ve had my share of that as well. It makes for good follow-up editorials. The idea for the book came from a discussion with the I&M publisher, Marianne Stanton at a Christmas party she hosted when we both discovered we’d been with the paper for twenty five years. I’ve also produced many articles, with photographer Terry Pommett for Nantucket Today, the I&M published magazine so I have a long standing love affair with how people on Nantucket live and perfect their nests. Last Christmas a group of ladies came into my shop and as they went around to each table set with a different holiday theme they kept exclaiming, “That’s A Great Idea!” and suddenly I had the title for the book that was in progress. If you haven’t been reading my column over the years the following will give you a sampling of what you’ll find in the September section of the 364 page paperback that has just come out today and can be found in most island stores. As we go into the fall season our thoughts turn inward toward our homes. Some of us have ignored our interiors all summer for the allure of the outdoors. We’ve been gardening, beaching, entertaining on the deck and doing things away from home. In general, we’ve taken advantage of the beautiful weather we’ve had all summer. But now, as a writer of such things, I am being asked, “What are the latest trends in home decoration?” Having been involved with the home furnishings department of Marine Home Center since last February I’ve become especially tuned in to the subtle changes. David Holland, their new design manager has been redesigning the showroom to reflect different ways to use color in a Nantucket décor. Years ago I did a lot of work for House Beautiful and especially admired the editor in chief, Louis Oliver Gropp, a well-respected designer with a lot of down-to-earth attitude. I find myself going back to his written words when asked questions about design trends. Most decorators I respect have a passion for “editing” as we say in publishing. They are equally passionate about light, that element that gives a room it’s magic. Most magazine editrs I’ve worked with do not like window treatments. They especially like high, open windows because the best rays come in through the top part of the window. “Get rid of heavy window treatments and let the daylight in,” advised one decorator, “Have all the outlets in a room tied to a dimmer switch. Baby boomers are too old for overhead lighting.” I guess this could apply to any of us, young or old. I have a dimmer switch on all my living room lamps so that I can flick a switch on the wall and all lights go on or off at once. In this way I have all the lamps at just the right setting so the light is perfect throughout the room. It’s a subtle thing, setting lighting just right so that when the sun goes down and there is a need for lighting it is always perfect. There is a whole vocabulary devoted to color as a critical consideration in decorating. A new phrase cropping up in the design world is “almost colors.” These are colors that change with light and are so ambiguous they are hard to describe; light blue that is almost charcoal or gray that is turning to green.” One decorator I love says a room only needs good art and a down sofa. Most decorators abhor the idea of a family room. They say it announces that the “living” room is not for living. Come down to Mitchell’s tomorrow evening for a glass of wine and share some of your great ideas.